A letter from the Texas Education Agency about funding for schooling in migrant shelters highlights the ongoing push and pull between federal and state agencies. Texas’ top education officials told school district administrators Friday that they cannot use state funding to provide schooling for children housed in migrant shelters. The announcement — issued in a letter sent to all school superintendents statewide — has raised concerns for both shelters and school districts, whose leaders say it highlights a broader pattern of push-and-pull between the state and federal government over regulating shelters. Leo Lopez, the Texas Education Agency’s associate administrator for school funding, said in the letter that according to state law, Texas public schools can only fund education in shelters — where children are held by federal agencies — through external sources like tuition. The U.S. Department of Health and Human Services mandates that migrant shelters must provide children with six hours of schooling on weekdays as well as special education services. HHS did not immediately respond to an email requesting comment. Sal Cavazos, the vice president of educational services at Southwest Key, one of the companies that operates shelters for migrant children, said that partnerships with local school districts are needed in order to “enhance” the resources that it provides to children. “It’s just disappointing that we cannot come together all hands on deck to work with and support these young people that find themselves in a very difficult situation,” he said. Although Southwest Key receives funding from the Office of Refugee Resettlement for the purposes of meeting the education requirement, its centers often rely on local school districts for additional benefits like special education and ESL classes, he said. One of the company’s shelters in Harlingen, holding 50 students, had received one teacher, one paraprofessional and a building with two classrooms from the local school district. Southwest Key had only provided one additional paraprofessional, Cavazos said. 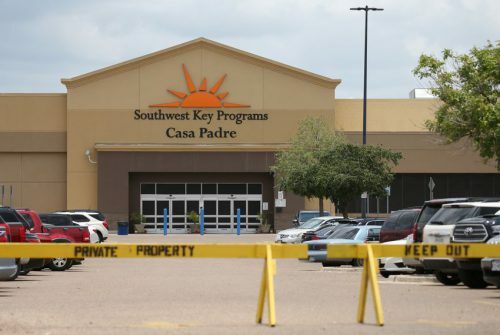 Shane Strubhart, a spokesperson for the Harlingen district, said that it will now have to “reevaluate” its presence in the Southwest Key shelter, which it had supported with about $5,000 per student annually. The TEA letter also said that school districts cannot count children in Texas shelters as their students in applications for state education funding. The school district in San Benito had previously applied for an additional $2.8 million in funding from Texas by counting its students inside shelters, the Associated Press reported. But following the TEA letter, San Benito administrators said that they will be forced to end their partnership with a local Southwest Key shelter too. The broader conflict about whether state funding can be used highlights this muddled political issue with few clear lines about where federal and state responsibilities begin and end. Brownsville ISD Superintendent Esperanza Zendejas said that if the state is unable to provide funding, the federal government should take a more hands-on approach. After Zendejas reached out to TEA seeking guidance on a potential partnership with a Southwest Key shelter in her district, she received a letter from the agency informing her that education within migrant shelters must be handled by HHS. In June, the Texas State Teachers Association had penned a letter to Texas officials calling on the government to develop and fund a plan to educate the growing number of detained migrant children. This entry was posted in KRTS News and tagged education, migrant shelters, txed. Bookmark the permalink.